The Little Black Dress Initiative (LBDI) continued this week with a Poverty Awareness Symposium, on Wednesday, 24 February. JLL members, including the 55 participants of the LBDI, were invited to a panel discussion featuring two of Junior League of London’s partners – Suited & Booted and Smart Works – to learn more about their organisations, and how members can help. Thank you very much to our sponsors, Facebook and Sweet Sally Tea, for helping us host a great evening! Natasha Turner, JLL member and co-founder of The LBDI, moderated the panel discussion. She highlighted the fact that over 1.2 million people live in poverty in London – that’s over 25% – and roughly 2 in 5 children are also in poverty. An extra complication is added when entering the job market – those who cannot afford the right outfit, will be least likely to secure the job they need. Suited & Booted and Smart Works both strive to not just give their clients new outfits, but to also give them the confidence and self-esteem boost that can truly change their lives. Their employees and volunteers are carefully selected to help select and style clients’ attire, and also to cheer them on as they head off to their interviews, and congratulate them once they get the job. The work isn’t quite done there. Help is also provided in selecting outfits to keep them going until their first paycheque. Suited & Booted works with underprivileged men seeking employment. Dr. Maria Lenn, Chief Executive, said they are in need of good shoes or a good cobbler, cuff links, pocket handkerchiefs, slimmer-fitting suits. The organisation is also currently seeking a new space for its operations. If you are able to assist, please contact Suited & Booted here. Smart Works provides professional attire and interview training for women. Georgina Albel, UK Head of Partnerships, asked for donors to think of the details of what you use to get ready in the morning – makeup, hair accessories, deodorant, handbags, tights – beyond just clothing. Donations of all kinds are always appreciated. 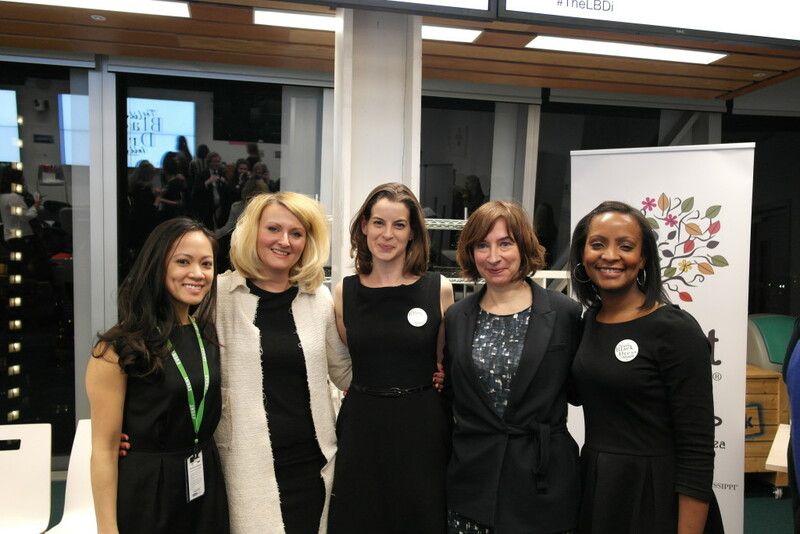 Suited & Booted and Smart Works both thanked The Junior League of London and The Little Black Dress Initiative participants for all their help and support. We, in turn, are appreciative of the time Georgina and Maria took to come speak to our members and further educate them on the issues facing those living in poverty. We’d also like to extend our thanks to Cynthia Ward and Natasha Turner for their work in The LBDI, and to Michelle Capp, Brittany Williams, Blake Gray and Claire Roper for their hard work putting the evening together!